Get back to your day Job…. One of the phrases we use when communicating with the team is “get back to your day job”. A steady stream of queries, requests, blog posts and feedback between the team and admin support, back here in the UK, makes us wonder sometimes where they find the time to actually do the expedition! It is a balance between living the story and having time to tell the story. 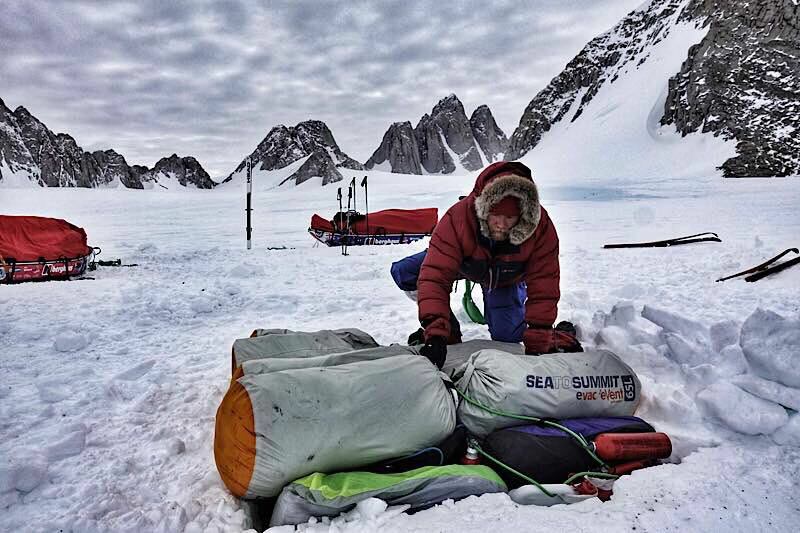 Leo, Jean and Mark are so passionate about their adventure, that they are willing, after a difficult challenging day, to sit down and write at length and sort through photographs to share what they have just experienced. They love reading the comments that are left on this blog (and Instagram/Facebook/Twitter) – and even promise one day soon, to send some answers out to some of the questions.. But now they are in the mountains, and are starting to explore the steeper ground. It is not always so easy for them to sit down comfortably in a sleeping bag and tap out a daily blog or upload the photos on the [failing] internet modem. So the message was sent, to “get back to your day job”. We are not sure they will be able to resist the temptation of tapping out a blog post for much longer, but we’re sure in the next day or so the stunning photographs and gripping words will be back. Watch this space! In the meantime, for those needing a daily “fix”, here are the team in Norway this spring “geeking” with the MtnHaus team from Berghaus- doing their day job! Thanks M. Spectre admin. for these non-newz, It’s important to have words every day. If not, it’s like if there were no chocolate a day in the avent calendar! We are glad you like the blog. Yes, it is like a “healthy” advent calendar – but we will have to make it go further than the 25th December…. !! I’m really enjoying the blogs and the story so far. And really looking forward to this next part – the hopefully successful ascent of the Spectre mountain. On the modem – it seems there wasn’t a spare or a spare spare of whatever was needed (dodgy lead / modem?). Whilst technological advances over the last few years have been fantastic and they’re enabling me to write this so that it can be (almost instantly) read by Leo, Mark and Jean, things break. It would be interesting to know a bit more about the IT kit for the team, and whether any redundancy in the IT was considered at the planning stage. I, with many others, advised Leo and the team on both equipment and robust redundancy strategies. In fact a lot of the systems (both adventure and technology) we trialled while together on our Greenland Snowkite 1600km trip in 2016. We classified all the equipment as to whether it would be a “show-stopper” or not. So losses to things like a stove fuel pump, tent, skis etc. would call a halt to proceedings while loss of camera, kindle or sleeping mat would not. We then looked at those individual “show-stopping” items and looked at how many levels of backup we felt were appropriate to carry. Many polar experts like Carl Alvey, Paul Landry, Michael Charavin, Hannah Mckeand etc. were quizzed for hours until a general pattern emerged of “best practice” based on experience. But not wanting to stop there we looked at diversity in backup (to eliminate common failure points) and substitution (snow shovel makes a good plate…). Of course this then all had to balance with the constraint that all these backups had to be hauled back up to the polar plateau without the luxury of kite-assistance (into the wind). So now to be more specific on the modem. The modem is not classified as “show-stopper”, in failing it is inconvenient from a blog and social media point of view, but the team can carry on their expedition without it. The story of the expedition might not be told until they get back though. From what I understand the modem usb port is at fault as the team carry spare cables and have already tried substitution. The comments from the post the other day “Iridium No Go” have been sent to the team and they will try some of those fixes. 2 * Delorme InReach tracker and messengers – these can send satellite text messages and are used by the team when they are communicating with ALE or other teams who are in Antarctica who are similarly equipped. The 9555 telephone can be used as a modem and within the team’s data pack (which is held on multiple devices) they have the software and instructions to enable this functionality. It is slow though. I guess what is interesting is that, the techniques and practices of one industry or sector (i.e. IT) are transferable across to another (say, polar exploration). And in all seriousness Leo and the team are likely to approach someone like you, with specialised knowledge of redundancy systems and strategies, and try and apply it to their application rather than try and discover the strategies from trial and error. Like I said at the beginning, interesting question – I hope my reply, kind of fits in with your thinking. Let me know if you want any more info on what tech they have taken. So it’s cold, snow is on the high ground, ice is on our car roof and windows. But we will against all the odds go to Chester’s and buy there home made bread. It maybe a grind, it maybe a pain but we will buy it and we will eat it in little langdale this weekend.